Mercedes-Benz has introduced a production version of a headlight that adds an extra visual safety feature to a driver’s assistance systems. Debuting at the 2018 Geneva Motor Show, the DIGITAL LIGHT is a new HD-quality headlamp that incorporates over 1 million micro-reflectors inside. These reflectors can reorient in patterns to project information graphics on the road ahead. The system is intended to not only be an alert to the driver, but potentially a communication tool for other motorists, cyclists and pedestrians. 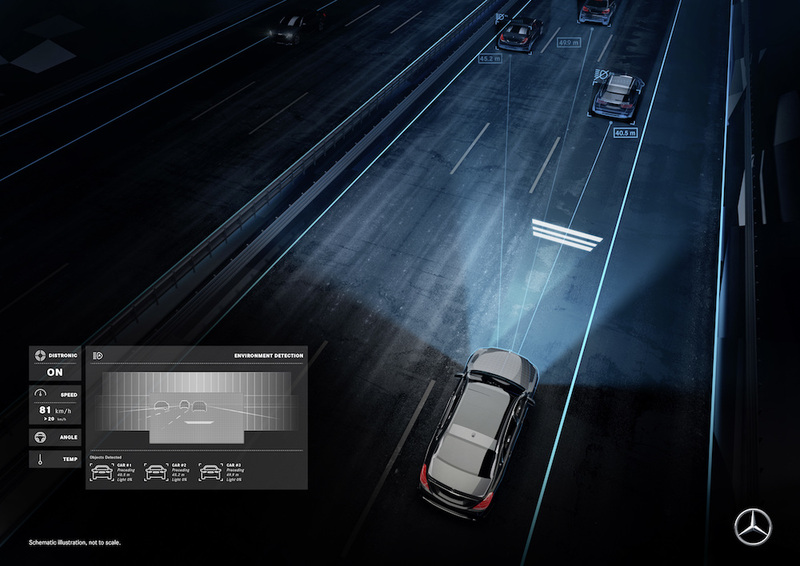 Working in combination with integrated cameras and sensors, the headlights can display a number of directional and warning icons. For instance, in a construction zone, illuminated guide lines are projected forward to show the width of the car in a narrow lane. Other symbols include a pedestrian detection arrow, low-grip surface symbol, construction site symbol, rear-end collision symbol, lane keeping symbol, blind-spot symbol and speed symbol. Each headlight can also self adjust to avoid blinding oncoming cars or pedestrians. Cameras can detect the silhouette of a person or oncoming vehicle and reduce the angle of the beam to below their eye level. The Mercedes-Benz DIGITAL LIGHT headlights will initially be available on a limited production run of the Mercedes-Maybach S-Class beginning early this year.